With an Offcloud account, you have unlimited access to a wide spectrum of premium file sharing services and websites, like Uploaded.net and Rapidgator. To use them, you just need to paste their link into Offcloud and click Fetch. Premium file sharing services offer faster downloads compared to free services and they offer premium content that is not available to free users. Setting up an account for all of these premium file sharing services bears a lot of disadvantages, including the costs, the problem of managing all of the credentials (usernames and passwords) and the flat-out security and privacy risks that connecting to these services entails. Offcloud spares you the pain by doing all the hard work and stepping in between you and file sharing websites, like Rapidgator. Your privacy will be protected, while Offcloud connects to their service. You don’t need a premium Rapidgator account. You can benefit from our infrastructure with dedicated high-tech servers and unlimited bandwidth. 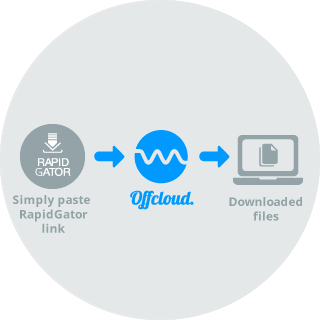 With a free Offcloud account, you can download up to 3 BitTorrents or links from premium file hosting services, like Rapidgator. Then for as low as $9.99 per month, you can download any number of BitTorrents and enjoy unlimited access to premium file sharing sites.